TVS Motor Company production plant in Hosur. Photograph by Hemant Mishra. Mumbai: TVS Motor Co , India’s No. 3 two-wheeler maker, said on Thursday it posted a 40% rise in net profit, riding on an increase in sales during the festival season and said it was confident of achieving a growth of over 15% in the current year. The company’s retail sales rose 20% to 250,000 vehicles during the festive season in 2011 from a year ago, it said in a statement. “The company witnessed high retail growth during the season which has resulted in significant liquidation of stocks, both at the company and dealer end," it said. TVS, which makes the Flame and Apache range of motorcycles, said it expects to sell over 200,000 vehicles per month in Novemeber and Decemeber. 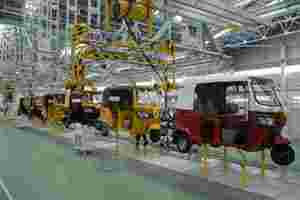 India’s automobile industry is expected to grow 11 to 13% in the fiscal year ending March, Pawan Goenka, president of industry body Society of Indian Automobile Manufacturers (SIAM) said in July. In October, Hero Honda Motors , India’s largest motorcycle maker, posted a better-than-expected 13% rise in quarterly net profit, driven by strong demand and volume growth. TVS sold 183,718 units in October 2011, compared with 195,271 units sold during the same month a year ago, it said. The firm’s total two-wheeler sales during the quarter ended September rose 16% to 597,000 units, compared with 516,000 units in the corresponding period of the previous year. The company’s shares closed marginally up at Rs66.45 in the Bombay Stock Exchange.